Quality Laminate table for hire that has folding legs. They comfortably seat 10 people, using the bistro chair. We also hire linen table cloths to go with all of our tables. Our bar tables are a great space saving solution, but also help create a great atmosphere at any event. They can be used a cocktail tables at parties or as a sign in table at the front door of corporate events. 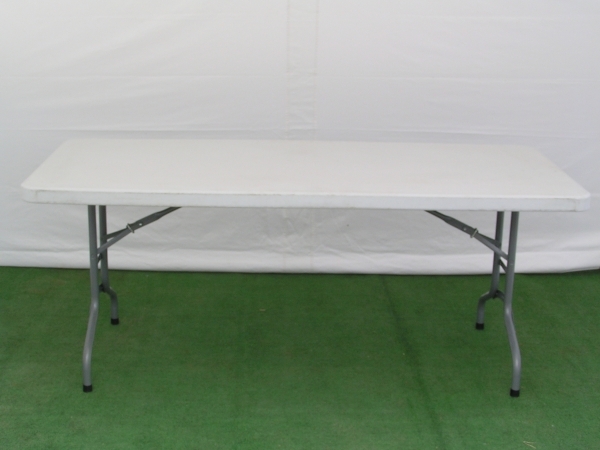 Quality lightweight blow moulded trestle table for hire that has folding legs. They comfortably seat 8 people, 3 down each side and 1 on each end or seats 6 if joining the tables end to end to make longer tables using the bistro chair. We also hire linen tablecloths to go with all of our tables. Quality light weight blow moulded trestle table with folding legs comfortably seats 10 people. 4 down each side and 1 on each end, or seats 8 if joining the tables end to end to make longer tables. They are often combined with our bistro chairs at parties or events. We also hire linen table cloths to suit. 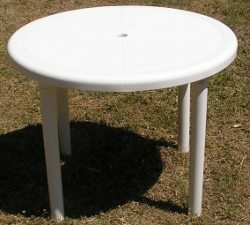 Our white outdoor round tables for hire have a radius of 93cm. They comfortably seat four people when combined with the bistro chair. Its great to get the kids to sit down to eat. Try with our kids chairs. Instant Party Hire provides hire services for tables all across Melbourne and the surrounding suburbs. Whether you require a table hire service for a small party at home, school function or production, staff training/information session, or even for a wedding in the park, we can surely assist. Table hire remains a cornerstone of any event hire service in Melbourne. Whether you need table hire for a banquet or any other formal event, we can provide a wide range of popular options that would definitely please your attendees. Plenty of our customers call on us for help with trestle table hire in Melbourne. Trestle tables remain a popular choice among our clients, no matter the type of event. Combined with a good choice of tablecloth or event linen, they make for the perfect mix of good aesthetics and functionality. When it comes to large events, you can never go wrong with picking out a combination of different tables. Foldable tables can provide ease with setting up for your event and can even be stocked as spares in case of an unexpected turnout. Our table hire service also comes backed with a comprehensive selection of chairs and other furniture hire options, so be sure to check with our team when you next inquire about trestle table hire with us in Melbourne. Even smaller scale events can find plenty of uses for trestle table hire in Melbourne. Trestle tables provide a versatile way for you to maximise floor space of your venue, whether for a reception or dining area. If you anticipate limited floor space at your venue, trestle tables may even provide the handy option of stowing away with ease. Imagine being able to easily convert your spaces at your next event, with minimal fuss over having to move too much furniture around. At Instant Party Hire, our team aims to please. No matter the style or size of your next event, consider how we can help provide a variety of furniture hire options to help you bring your dream event to life. With plenty of events and event furniture hire experience under our belt, we would be more than happy to consult with you and to make recommendations on how else your event could benefit from an effective furniture hire service. Our staff will help you throughout the process of setting up your event. We begin by helping you choose the most sensible package to meet your needs, and complete the process by delivering all the tables, chairs, and marquees that you will be needing. So if you are looking for a reliable table hire service in Melbourne, call today for a free quote.